UFC flyweight champion Henry Cejudo is coming up to the bantamweight division to battle Marlon Moraes for the vacant belt on June 8 at UFC 238. 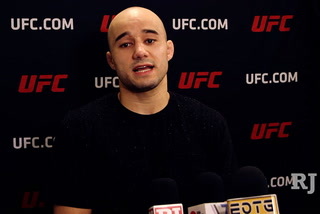 Moraes said Cejudo will regret going after a second title in a new division and added that he thinks his path will cross with former champion TJ Dillashaw in the future. UFC strawweight Paige VanZant was briefly linked to fight at UFC 236, but had to withdraw from the bout due to a broken arm. As a guest on the RJ Ringside Podcast, she detailed the injury and also spoke about joining the M-1 Global booth as a color commentator. UFC 236 will feature a pair of interim title fights. In the main event, UFC featherweight champion Max Holloway will face lightweight contender Dustin Poirier and middleweights Israel Adesanya and Kelvin Gastelum will collide in the co-main event. 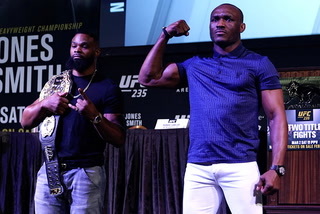 UFC 236 will take place in Atlanta, Ga., on Apr. 13. 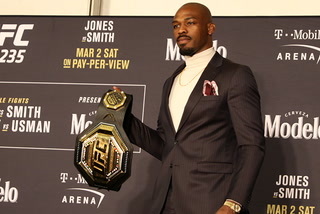 Jon Jones retained the UFC light heavyweight belt when he earned a decision over Anthony Smith in the main event of UFC 235. 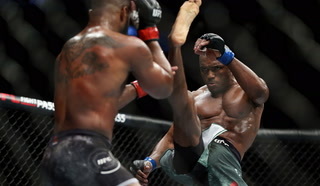 Kamaru Usman became the first African-born fighter to claim a UFC belt when he defeated Tyron Woodley to become the promotion's new welterweight champion. 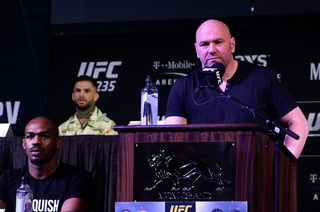 All 24 fighters competing at UFC 235 at the T-Mobile Arena on March 2 stepped on the scale prior for the official fight card weigh-ins. All four fighters competing in the title bouts slated for the event made weight. 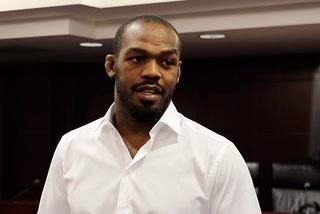 Though recent drug test results still show trace amounts of Turinabol in his system, UFC light heayvweight champion Jon Jones says he has no shame and is hiding nothing as he prepares for his UFC 235 title bout against Anthony Smith. Despite UFC light heavyweight champion Jon Jones being in the spotlight for drug test discrepancies and other outside the cage struggles, Anthony Smith says he is tuning out the noise and remaining focused on the challenge of beating the reigning champion in the cage. Highlights and staredowns from the top three fights on the UFC 235 fight card taking place at the T-Mobile Arena on March 2. 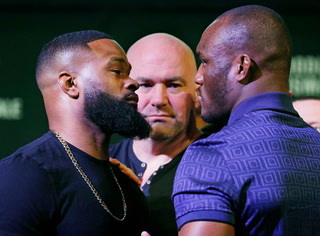 UFC welterweight champion Tyron Woodley and Kamaru Usman have a heated exchange and Ben Askren enjoys his time on the stage by interacting with UFC president Dana White. 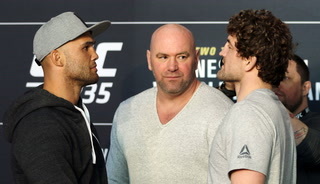 UFC 235 opened with Jon Jones returning after his meeting at the Nevada Athletic commission, Tyron Woodley and Kamaru Usman arguing on stage and Ben Askren making his UFC debut. 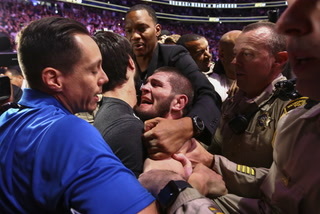 After announcing the fines and suspensions given to Conor McGregor and Khabib Nurmagomedov for their involvement in a melee at UFC 229 in Las Vegas, Nevada Athletic Commission Chairman Anthony Marnell said it may be time to address "mouthy fighters" smack talk and conduct leading up to a fight. 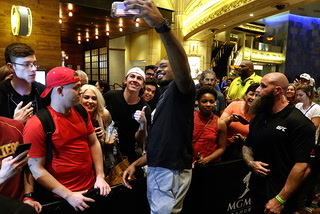 The Nevada Athletic Commission issued UFC light heavyweight champion Jon Jones a conditional one-fight license to compete at UFC 235 taking place at the T-Mobile Arena on Mar. 2. 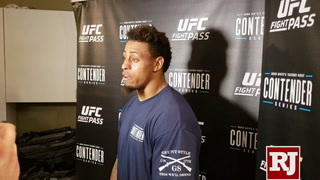 Jones had to reapply for a license in Nevada after failing a drug test which led to UFC 232 being moved from Las Vegas to Los Angeles, California. Looking for something specific in MMA UFC?